As a bard's apprentice, Kihrin grew up with tales of legendary deeds. He also steals, desperate to buy a way out of Quur's slums. Then he raids the wrong house, he's marked by a demon and life will never be the same again. Kihrin's plight brings him to the attention of royalty, who claim him as the lost son of their immoral prince. But far from living the dream, Kihrin's at the mercy of his new family's ruthless ambitions. However, escaping his jewelled cage just makes matters worse. Kihrin is horrified to learn he's at the centre of an ancient prophecy. And every side - from gods and demons to dragons and mages - want him as their pawn. Those old stories lied about many things too, especially the myth that the hero always wins. Then again, maybe Kihrin isn't the hero, for he's not destined to save the empire. He's destined to destroy it. Jenn Lyons lives in Atlanta, Georgia, with her husband, three cats and a nearly infinite number of opinions on anything from Sumerian mythology to the correct way to make a martini. She is a video game producer by day, and spends her evenings writing science-fiction, fantasy and paranormal mysteries. A long-time devotee of storytelling, she traces her geek roots back to playing first edition Dungeons & Dragons in grade school and reading her way from A to Z in the school's library. 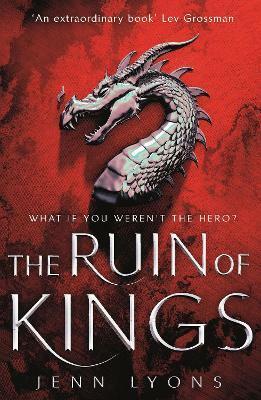 The Ruin of Kings is the first in the series A Chorus of Dragons.